Will Sawyer (Dwayne Johnson) spent time in the military followed by a stint in the FBI. He is now working as a security consultant and living in Hong Kong with his wife Sarah (Neve Campbell) and their two kids, Georgia (McKenna Roberts) and Henry (Noah Cottrell). His latest contract is inspecting a building constructed by Zhao Long Ji (Chin Han) known as the Pearl. The Pearl is the world’s tallest building with residential housing in the upper half of the building. If the building passes Will’s inspection, Mr. Pierce (Noah Taylor) will approve the insurance policy and they can open the housing portion. When a fire breaks out in the Pearl just a few floors below Sarah and the kids, Will must get back into the building to rescue them. That is when he finds out there is a group of men who have taken over the building and everything in it. Will must not only save his family from the fire, but also from the men terrorizing the building. It wouldn’t be summer blockbuster season without a big action movie starring Dwayne Johnson. This year, we get Skyscraper. Given how this summer has gone, it is a fitting pick. Everyone knows Dwayne Johnson is a solid action hero. We’ve seen him do everything from bust up corrupt casinos, run through the jungle, and drive armored vehicles through a frozen wasteland. This time he does his best John McClane, going up against a gang of bad guys and a fire in a high-rise to save his family. He handles the action as well as expected, it’s the script that is the problem. It feels like I haven’t seen Neve Campbell in forever – Scream 3 and Party of Five are both 18 years old now. Like Johnson, Campbell does as well as can be expected with what she has to work with. The rest of the cast is replaceable with just about anyone else, serving mostly as clichéd set dressing. The story feels like a Die Hard remake. Terrorists take over a building and the hero must make his way through the building to beat the bad guys and save his family. We even get a scene that is almost a direct callback to Bruce Willis swinging through a window. The story is jumbled and predictable. The bad guys are easy to spot as soon as they step on screen. The whole movie seems to take every action movie trope and try to shoehorn it in. There are a fair share of plot holes that would normally be excusable in this type of movie, but given the execution of the film, it just adds up too much. I mean, (mild spoiler alert) the parachute is literally sitting at his feet and then it is never used or mentioned again. It was an easy out, but they chose to let it go for a more convoluted ending. Dwayne Johnson movies always have an incredible amount of potential. Aside from a minor blip here and there, he generally delivers with exceptional style. Skyscraper falls into that “minor blip” category. 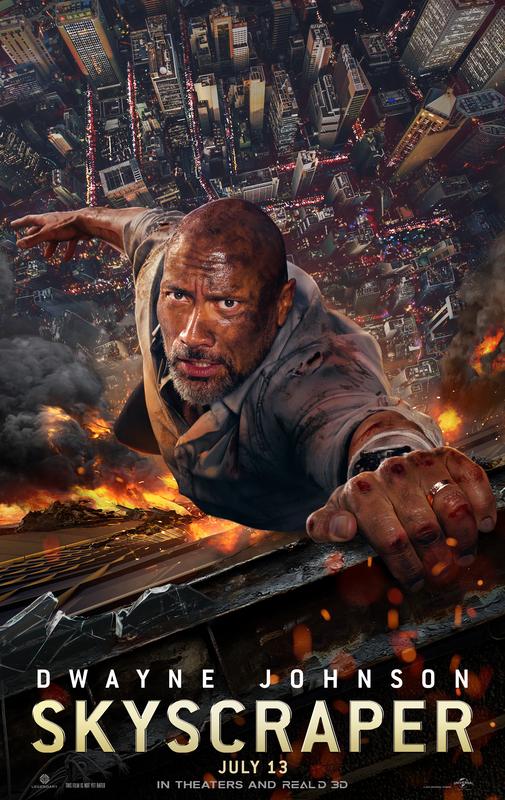 Trying to one-up one of the most popular action movies, it aims too high, literally and figuratively, and falls short. Even with its PG-13 rating, it feels a bit violent for a movie starring the Rock. If you’re going to see it, it is a big action movie, so I’m tempted to say see it in the theater. However, you could wait to rent it if you bother with it at all.